How much money do you spend on food and beverages each month? If you're like most people, you probably can't answer that question without some serious thought and a calculator. So, let's help you get a little closer to determining your monthly food and beverage expenses by using a real case study of one person's daily food and beverage consumption. Her name is Sandra. Like millions of people around the world, Sandra really wants to lose weight but refuses to spend any more money on those fad diet products that never seem to work like the advertisements promise. Sound familiar? We asked Sandra a very important question: "If we could show you how to lose weight using a proven system without spending any additional money, would you be interested in getting started?" Sandra was not only interested, she was excited. When we did the math, we discovered that Sandra was spending approximately $22 per day on her food and beverage choices-an average of more than $600 per month. The real problem was that Sandra was gaining weight and couldn't see how she could fit the cost of a weight-loss program into her budget. That's when we showed her the MetaboWize™ weight management system. By combining the MetaboWize™ System with some healthier food choices, Sandra discovered a way to eat more, spend less, and lose weight at the same time. When we did the math, we discovered that Sandra would get five healthy meals and daily supplements for just $19.58 per day with the MetaboWize™ System. The most exciting part was we showed her how to enjoy the benefits of the MetaboWize™ System and eat more without spending any additional money. Sandra simply exchanged the money she was spending on the other foods and beverages for the MetaboWize™ System products along with healthier food and beverage choices. Not only was Sandra able to afford the MetaboWize™ System, but she had also saved enough money to treat herself to some new clothes to celebrate her new, leaner body. The savings are real. 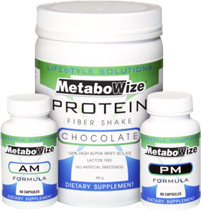 In fact, MetaboWize™ users from around the world have reported that they have actually seen their monthly food and beverage expenses go down significantly using the MetaboWize™ System.